Algeria has begun three days of national mourning for the 77 people killed in a military passenger plane crash in the north-east of the country. Just one person survived when the Hercules C-130 crashed into a mountain in Oum al-Bouaghi province, en route to Constantine, in bad weather conditions. President Abdelaziz Bouteflika has praised the soldiers who died in the crash as "martyrs". Most of the 78 passengers were military personnel and their family members. The lone survivor, a soldier, is reportedly being treated for head injuries at a military hospital in Constantine. The defence ministry said it had set up a commission to investigate the crash and that Ahmed Gaid Salah, who is both army chief of staff and deputy defence minister, would go to the crash site. In a statement, the defence ministry blamed "very bad weather conditions, involving a storm and heavy snowfall" for the crash. Security sources and state media originally reported 103 people on board the flight, but the number was later revised down by the military to 78. "I saw the military plane crashing, and it was cut into two pieces," a firefighter, Mohamed, told Reuters news agency at Ouled Gacem, near the crash site. Women and children were among the bodies recovered from the crash site. Image caption The president paid homage to those on board - mainly military personnel and their families - as "martyrs"
President Bouteflika sent his condolences to families of the "martyrs" and decreed three days of national mourning to begin on Wednesday. The flight's departure point was the Sahara Desert garrison city of Tamanrasset, 1,500km (950 miles) south of Constantine. It made a stop in Ouargla. A source told radio station Ennahar - which has close links to the government and army - that contact was lost with the military plane between Oum al-Bouaghi and Constantine as it was descending to land. It crashed into Djebel Fertas mountain, some 380km (240 miles) east of the capital Algiers. "The plane crashed into a mountain and exploded," an official told Reuters. 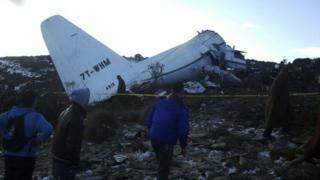 It is the worst plane crash in Algeria for more than 10 years and the third involving an Algerian military Hercules. An Air Algerie Boeing 737 crashed on take-off from Tamanrasset in 2003, killing all but one of the 103 people on board.